Deputy Chief Kenneth Bugado Jr.
Deputy Police Chief Kenneth Bugado Jr. was confirmed to the deputy chief’s position by the Hawaiʻi County Police Commission on December 20, 2016, and assumed the role at the close of business on December 30, 2016. Bugado had previously served as the captain of the Criminal Intelligence Unit and the Office of Professional Standards since 2013. 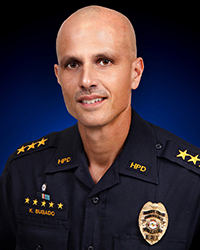 He joined the Hawaiʻi Police Department in February 1989. During his career, he worked as a patrol officer and sergeant, Criminal Intelligence Unit detective, and lieutenant in the Administrative Services Division, where he managed the Police Department’s Accreditation Section.